I was talking in general about microvolt and nanovolt and microamperes and nanoamperes measurement with any instrument. At those voltage and current levels, impedances are so high and measured signal is so low that parasitic emissions, static fields, magnetic fields, triboelectric and thermal effects are sometimes greater than signal you are trying to measure. True, but if you have been reading through this entire thread, especially recently, you will see that Frank kindly repeated my M-ohm resistor test with his uCurrent (because I don't have a uCurrent), and his readings were spot-on. However, my readings with a US$1k+ Fluke 8845A were way off, as per the table I posted earlier in this thread. So despite the "parasitic emissions, static fields, magnetic fields, triboelectric and thermal effects," the uCurrent appears to be far more accurate than my Fluke 8845A. uCurrent natively has 1mV/1nA scale... So 1nA is 0.1% on a 1000mV(1V)/ 1 uA scale.. Fluke has 100uA full scale, and nanoamps are in the few last digits.... And those digits are riddled with errors and offsets.. So yes, uCurrent can make better measurements at that level than a 1000 USD instrument. And, you are very welcome, I'm glad if I was of any help..
Have you considered that there might be something wrong with your meter? Why do you think that should make any difference? I already suggested to short the input at the terminals and check for instrument offset. Maybe autozero is not on. Maybe instrument is noisy and/or damaged... But fact is that he tries to measure 10 nA with precision, and that is last two digits on his instruments (10 ppm of full scale). So even 1-2 LSD flicker represent 10-20% error. He might even try to enable filter to try to suppress interference. Also, your Gossen is a very fine instrument... It probably works much better that guaranteed specs.. And his might just be border line on specs.. Agreed. Instrument offset is probably the major culprit, with the addition of some instrument inherent limitations. I don't think he mentioned yet when the meter was last calibrated. He'd be lucky to measure within 10nA with a perfect instrument. The Gossen 30M is an order of magnitude more accurate than the Fluke on small currents, with the same count. Accuracy of the Gossen seems to be on par with the uCurrent, as measured by FrankBuss. CMRR on the Fluke 8845A is supposedly pretty good at 140dB (50-60Hz), compared to the Gossen's >80dB. I tested uCurrent with a 10M 1% resistor at 0.1V to 1V, result shows ~-1mv offset plus -1%. No question. It's clear I need to buy a uCurrent Gold. But again, NO STOCK! A fellow can't win! My 8845A was purchased in June 2012. It is only used every now and then, perhaps once every couple weeks for a short period. It has never been calibrated. Regardless, see Fluke's reply to my previous post above. What they wrote would seem to apply to old 8845A and brand spanking new fully just-calibrated 8845A's too. Besides, even if one wishes to argue my meter is way off and needs to be calibrated, I counter that by presenting this data. Take note that uA measurements are accurate but only nA measurements are way off in la-la land. If my meter was messed up calibration wise, I would expect my uA or even mA measurements to be way off too, but they are not. Anyone know when there will be more stock of the uCurrent? When I first held Fluke 87V in my hands, I was surprised how much offset it has in DC uA range, I thought that was faulty instrument. 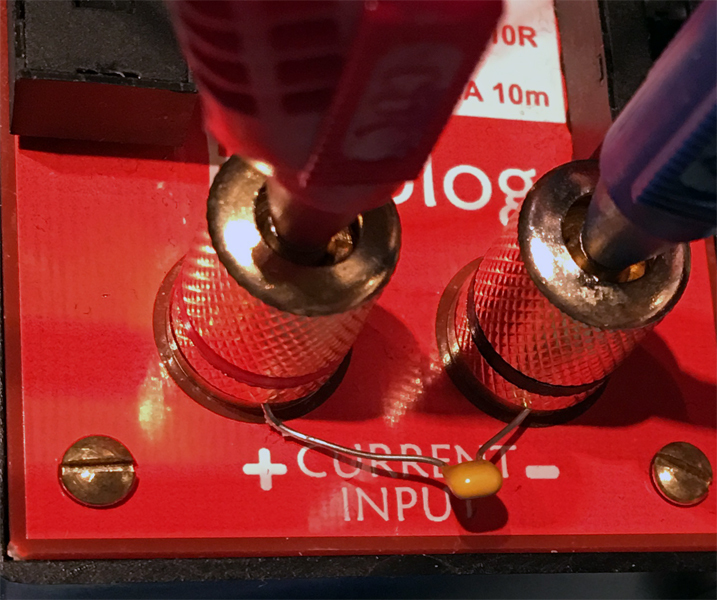 Then I found that thread https://www.eevblog.com/forum/chat/fluke-87v-non-zero-current-reading/ and I finally put up unwillingly with that. But every time I switch on my second meter UT61e and range to DC uA with 0,00uA dead on, I do not know what to think - maybe it has something with better input protection on Flukes? How many Flukes is plagued with that feature (large offset on uA range)? Fluke is only quoting the accuracy figures for the 8845A that you could have known about before post No.8, if you had bothered to read the manual. 25nA accuracy on low DC currents is the worst it should display, within 1 year of calibration. Most will do a lot better than that. External influence factors are negligible at nA level. Best of luck with the uCurrent. Why such a smarty-pants reply? I've read the manual as has Fluke. And I would encourage everyone to read through all the posts in this thread prior to casting a stone of judgement. For as I said earlier in this thread, and as the DATA which I posted clearly shows, my Fluke meter is not a "problem unit" insofar as the uA measurements are quite accurate. If one wishes to argue "it's been 5 years since you bought it and therefore it needs to be recalibrated" or "you have a problem inside your meter," then logic dictates that even my uA readings should also be "way off" but they are not. Because they are not, it seems reasonable to conclude that, just as Fluke said, this particular meter (model 8845A), is simply inaccurate in the nA range. I find that terribly unfortunate but not surprising in light of the fact that such is what drove Dave to create the uCurrent in the first place. As to uCurrent availability, the good news is that 49pcs magically appeared "in stock" as of today. This must mean that there are in fact many units in stock, just untested. Dave probably tests them before making them appear "in stock," which is a good sign about the quality of the unit. I still think there should be "official documentation" for the uCurrent -- hence the name of this thread. But until then we will just have to be diligent about reading through posts in this forum to ensure we avoid common usage pitfalls. My thanks to everyone who posted test data and otherwise contributed in a positive way to this thread. It now shows 48 in stock at US $64 each. Also, since I don't need mine anymore, I can sell you mine for $50. I finally acquired a uCurrent Gold and tested it for the first time today. uA and mA switch settings tested to be highly accurate, but the nA switch setting is so bad I think it is defective. Here's a video of my testing of all 3 switch settings. Please watch the entire video and then let me know what could be wrong with the nA switch setting. Please bear in mind how accurate my uA and mA test results are when formulating your conclusions. I used a fresh CR2032 too. TL;DR: Avoid feedback loops and terrible oscillation created by wires coupling from the output to input, and use a 100 nF capacitor at the input, if you need only DC. I left the uCurrent Gold at the office, and we are not closed for the next week in honor of Japan's "Golden Week" Spring holiday, but when I get back to the office I'll try the cap and try isolation and then report back here.